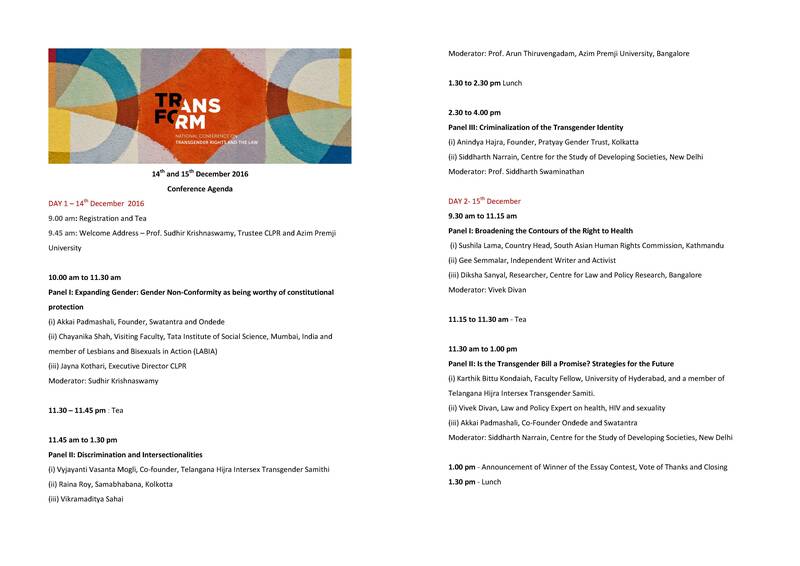 On the 14th and 15th of December 2016, the Centre for Law and Policy Research, Bangalore held a conference titled ‘TransForm: Transgender Rights and Law’ at the Indian Institute for Human Settlements. The conference aimed to deconstruct the complex and multi-layered experience of marginality and exclusion within the transgender movement. It raised issues concerning gender identity as well as disability and caste compounding social discrimination while critically examining these intersectionalities. This National Conference also hoped to engage and extend the boundaries of the current discourse on the rights of transgender persons and the law. 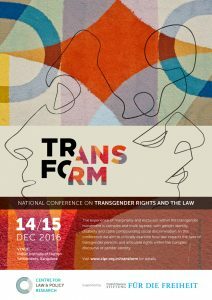 It further intended to explore how law impacts the lives of transgender persons and how rights may be articulated within the complex discourse of gender identity in order to fulfill the transformative promise of NALSA. 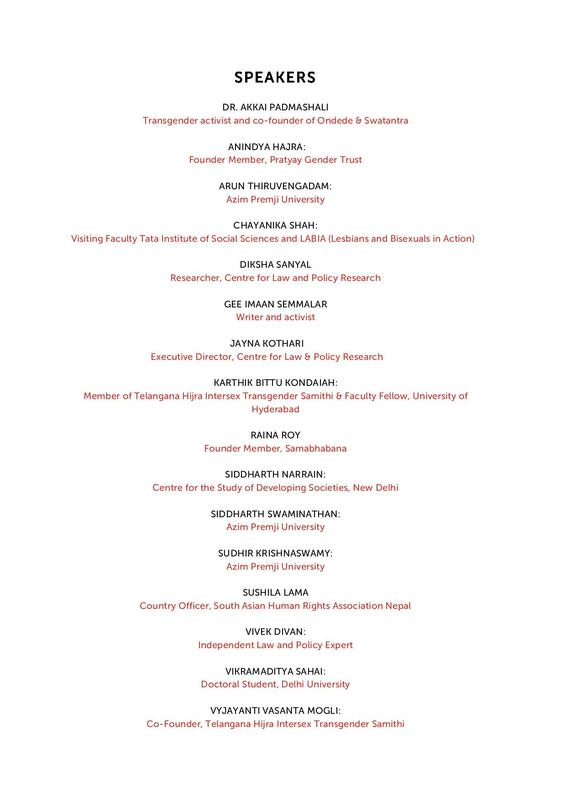 2014 was a watershed year in the history of constitutional rights for transgender persons in India. The Supreme Court in National Legal Services Authority vs Union of India (NALSA) recognized the rights of transgender persons to gender identity as part of the constitutional right to life and dignity under Article 21 of the Constitution. The Court also recognized under Article 19 (1) (a) the right to freedom of speech and expression to include the right to expression of one’s self identified gender. Even though the NALSA judgment is a critical first step in recognizing the right to gender identity for transgender persons, there are no constitutional protections for transgender persons against the discrimination and stigma they face. There are no legal guarantees to equal access to a range of social rights including the right to housing, employment, education, health and public facilities. Some attempts have been made to draft a law to cover these rights but the recent Transgender Persons (Protection of Rights) Bill, 2016 does not adequately address these issues. In addition to the need for enactment of new laws, the transgender community is disproportionately targetted by criminal law, be it under Section 377 of the IPC, Beggary Acts, State police laws which criminalize hijra communities and the violence they face within the criminal justice system on an everyday level. Criminal sexual assault laws do not take into account the transgender identity despite the community being one of the most vulnerable groups to sexual violence. It is necessary to engage in a conversation about the failure of criminal law to address these realities.